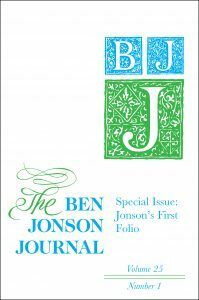 2018 marks the 25th anniversary of the Ben Jonson Journal. Read on and learn more about the history and impact of the journal from the editor, Richard Harp. Richard Harp and Stanley Stewart met in the winter of 1991 to discuss developing a journal centered around the life and work of Ben Jonson. 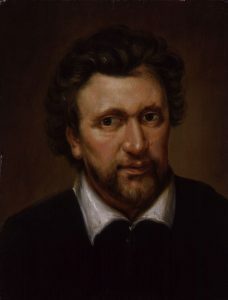 The unofficial poet laureate of England in the early seventeenth century, Jonson seemed a natural for such a project. The University of Nevada Press agreed, signing on to publish the journal beginning in 1992, with an editorial board that represented a cross-section of outstanding Renaissance scholars in America and the United Kingdom, including what would be the three General Editors of the Cambridge Edition of the Works of Ben Jonson: David Bevington, Martin Butler, and Ian Donaldson. Editorial offices were housed at the University of Nevada, Las Vegas, a fitting site, thought Donaldson, for a journal featuring the scholarly bon vivant, Ben Jonson. In 1995 Robert C. Evans, an active participant in the journal from its inception, became the third editor. From the beginning the editors intended that the journal should not just publish work about Jonson; its subtitle, “Literary Contexts in the Age of Elizabeth, James, and Charles,” indicated their desire for a broad range of cultural and literary submissions from the period 1500-1660. Essays concerned with the period’s poetry, theatre, criticism, religion, law, the court, the curriculum, medicine, commerce, the city and family life were solicited and received, a practice that has continued until the present time. The University of Nevada Press discontinued its publication of journals in 1996 and at the recommendation of Robert Evans an independent publisher, Locust Hill Press in Westport, Ct., took over as publisher for Volume 4. One of the last of a dying breed, Locust Hill’s Tom Bechtle operated a labor of love in publishing a list of outstanding critical literary titles that did not necessarily promise to make a profit but that promoted scholarship in diverse areas. The BJJ was his first venture into journal publication. Each annual issue continued to run, as it had before, between 250 and 300 pages. One year the editors thought they had gathered so much good material, which hung together well, that Tom was presented with the equivalent of 650 pages to put into print. Rather than telling them they were crazy, Tom swallowed hard and decided to publish a huge “special issue,” for which he charged libraries and subscribers no special, higher price. Volume 13 in 2006 was the last issue published by Locust Hill Press, as Tom then decided to retire. Edinburgh University Press then agreed to publish the journal, beginning with Volume 14 in 2007. In the ensuing years the journal has advanced in many ways. 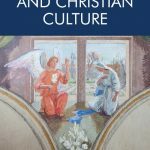 It is now published twice a year rather than just once; it has a very visible web presence, with all back issues available online; and its reach is even more international than previously. The journal’s online presence has been especially valuable, as in 2017 there were 4700 downloads of full text articles from over 700 institutions worldwide. The journal’s appearance has been one of its attractions from the very beginning, its format and cover design remaining unchanged from when it first appeared. The latter was composed by professional graphic artist Stan Holden (and fortunately for the impecunious fledging journal, a relative of co-editor Richard Harp) and has been reproduced by each of the three publishers. A sad moment in the journal’s history occurred in 2016 with the death of one of its co-founders, Stanley Stewart. Serving on the faculty of the University of California, Riverside, for over fifty years, Stan’s scholarly publications were numerous, authoritative and influential, responsible among other things for many generations of graduate students pursuing the humanities as a high vocational calling. A highlight of the journal’s recent history has been the institution of a series of literary awards, made possible through the generosity of Beverly Rogers, a Las Vegas philanthropist and bibliophile. Beginning in 2014 three awards were made for outstanding essays in each year’s volume: One $1000 “Beverly Rogers Literary Award” and two $500 “Ben Jonson Discoveries Awards.” Winners of these awards have included many of the outstanding scholars in English literary studies and a full list of their names can be found in each issue of the journal. To celebrate in style, the editors have selected 25 articles to be made free for the entire year. Enjoy the articles which have won the Beverly Rogers Literary Award, the Ben Jonson Discoveries Award and the articles published in the 2016 Jonson & Shakespeare Special Issue – all free until the end of 2018. Find and read the free articles here. 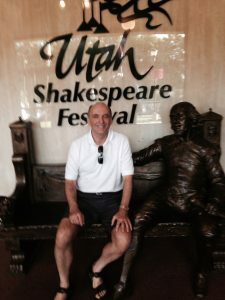 Richard Harp is Professor of English and Barrick Distinguished Scholar at the University of Nevada, Las Vegas. 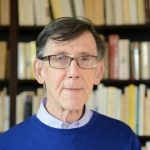 He is founding co-editor (with Stanley Stewart) of the Ben Jonson Journal and has published extensively on Renaissance literature, on eighteenth-century English literature and on modern Irish literature. He has co-edited the Cambridge Companion to Ben Jonson and has also edited the second edition of the Norton Critical Edition of Ben Jonson’s Plays and Masques.